Monitoring is important. Without monitoring, there can be no feedback, no planning and no improvement. Monitoring is crucial for detecting problems, optimizing performance, capacity planning, improving user experience, improving business impact... the list goes on an on. Yet in many companies, monitoring is an afterthought, neglected and underrated. Companies spend very little time and effort on it, create bad monitoring and then go on to ignore the data they collected completely. We often hear that "monitoring is hard" - and it can be, unless we do something about it. nir cohen was the ops team leader at fring and now works for gigaspaces. he's a relatively short, brown eyed human being who loves animals and holds true to ethics as a life path. he also likes to walk long distances, breathe and eat lettuce salad. you can find nir at work, roaming the streets or at home. Monitoring is non-functional, but at the same time, resource hungry. Monitoring requires the right people. #monitoringsucks because we're doing it wrong. We'll review the problem, which, as always, originates with people, not tools. Yoav Abrahami is the Chief Architect at Wix.com, working with developers and operations on building Wix's future products as well as accelerating and improving development processes. Prior to joining Wix.com, Yoav was an Architect at Amdocs Cramer OSS division. Yoav has a MS in Physics and BS in Computer Science from Tel Aviv University. Mark is a Mamram alumni, with over 13 years of experience in operations. As a monitoring Ninja at Wix he's responsible for building a fully automated monitoring solution for the multi-micro-services / wide-distributed / high-frequency-changing production environment. My loves, in order, are: Hangout with my gorgeous family, diving in theoretical physics and creatively solve problems as a sport. So we have deployed an application. It is running. How do we verify it keeps on running? How do we get notified fast about any issues with the application? How do we garantee the service level we want to provide our customers? The magic answer is to monitor our application. But wait, what does it mean to monitor? What metrics should we monitor? What is the effective way to monitor those metrics? what about alerts? In this talk we will explore a simple browser - server - database application with regard to monitoring. What role have end user experience monitors, server side performance, operation, error and system monitors, database monitors as well as alerts. Moshe is passionate about new technologies, coding, providing tools and VIM hacks. Currently Moshe is a problem solver at Forter and among other stuff leading Forter’s monitoring with Riemann and ELK stack. Forter has been using Riemann for more than a year in production to monitor our highly complex, distributed system. We are using Riemann as our hub for alerts (PagerDuty), latency and exception reporting (Kibana) and system probes (Jenkins). This presentation will cover Riemann patterns for maintenance-mode, state machine based alerts, statistical alerts, system and integration tests based alerts, event enrichment and aggregation for reporting. With over 10 years of experience, Shahar has been doing everything from hands on programming to complete system architecture. As Director of Engineering at BigPanda, He's responsible for designing and building the IT and software infrastructure that makes BigPanda tick. His passions in life (in this order): his wife and son, gourmet, cinema and code as craft. 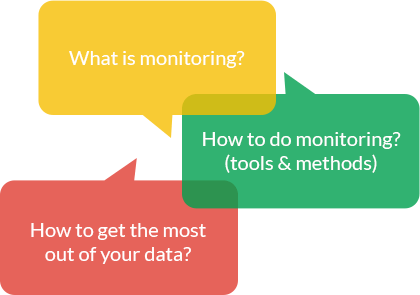 Monitoring should not be about tools but rather about choice. For two decades, the choice of what should be measured and monitored was dictated by the tools avaialble. Now however, with the exlposion of Open-Source and SaaS, the question should no longer be "What can I monitor? ", but rather "What should I monitor?" - a much harder but more important question to answer. Avishai is a veteran ops and a survivor of many prod skirmishes. Currently masquerading as the CTO of Fewbytes - a consulting company for Ops and architecture. "With great power comes great confusion". It is not enough to generate, collect and store metrics; One needs to know how to look and analyse them to get the full benefit of metrics. In this workshop we will learn how to use metrics to detect problems, correlate and investigate issues. This is a hands-on workshop. Although the workshop will use Graphite the methods are not Graphite specific. Tomer Levy is co-founder and CEO of Logz.io. Before founding Logz.io, Tomer was the co-founder and CTO of Intigua that developed innovative, Docker-like containers designed for large enterprises. Prior to Intigua, Tomer spent six years at Check Point, where he managed its Intrusion Prevention System (IPS) Software Blade from concept to market, generating $100M in revenue in the second year. Tomer has an M.B.A. from Tel Aviv University and a B.S. in computer science and is an enthusiastic kite surfer. Asaf Yigal is co-founder and VP of Product at Logz.io. In the past he was co-founder of social-trading platform Currensee, which was later sold to OANDA. Yigal was also an early employee of server performance monitoring company Akorri and storage resource management startup Onaro, both of which were sold to netapp. A Techion graduate, he created an AI algorithm on naval warfare for the Israeli military. ELK (Elasticsearch, Logstash, and Kibana) is the leading open-source, log-analytics platform that is used by companies including Netflix, Verizon, and Bloomberg to prevent and troubleshoot problematic events in their systems. We will first discuss the various use-cases of using ELK. From Ops monitoring, APM, forensics to security monitoring and business intelligence. In the hands-on part we will train attendees on how to get started with ELK by shipping, parsing, and analyzing log data and then visualizing the events to understand them. As part of the hands-on session, we will learn how to leverage ELK to monitor system and application performance using dockerized, collectd/collectl containers. To get the best learning experience, attendees should bring their own laptop, have access to a machine that generates logs and be ready to run the hands-on exercises with us. Nati Cohen is an operations consultant at Fewbytes, where he helps companies get the most out of their production environments. Before Fewbytes, Nati had a diverse experience in software development, *nix administration and security in the Intelligence corps and few start-up companies. To keep things interesting, Nati is also a research assistant at the DEEPNESS Lab in IDC Herzliya, looking into future network and cloud architectures. Back when doing fancy things on the web was called DHTML and just before the first high-tech bubble, Roman was already working the industry. He got to do backends, frontends and mobile apps. These days he does projects for Big-Co's and part time startup / open source / silly apps. Follow him on Github github.com/romansky and checkout his blog www.uniformlyrandom.com. "Developers, developers, developers.. " - The inventor of "Ballmer Peak"
Gather around as we get our hands dirty with code and tools to help you with monitoring your application and JVM level metrics. This workshop is all about coming to the office the next morning and putting this new found knowledge to use. You will be provided with a base image of Ubuntu with pre-installed Java application to which you will add monitoring and use different tools to investigate and understand whats going on inside.